If your Kick-it cell phone holder or Grip Pad breaks or wears from normal use, we will replace it for FREE. We only ask that you pay the shipping and handling for the new item. Click here to submit a claim for replacement. Can I remove the kickstand from my phone once applied? Yes, you can attach and remove the Kick It phone stand accessory as many times as you want to many different phones and devices. Will it leave any sticky residue or mess on my crispy phone? Absolutely not! 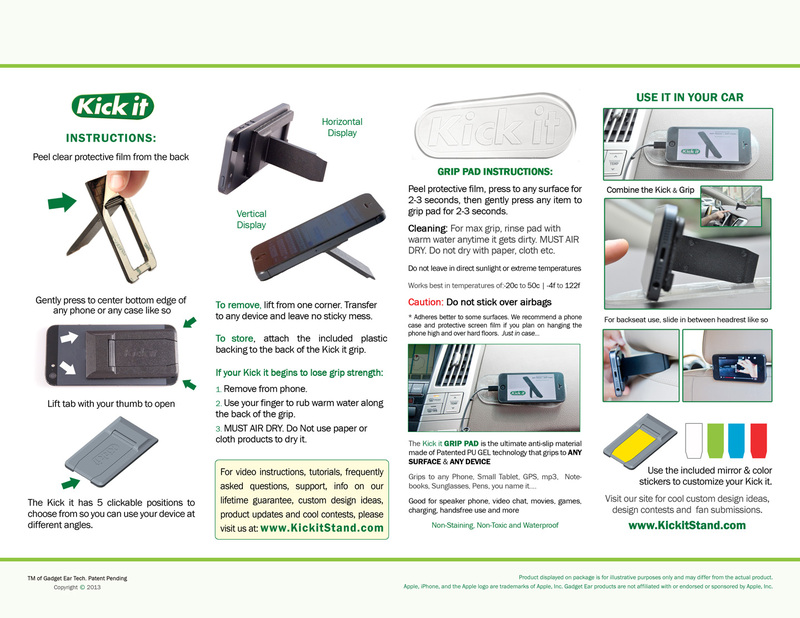 The Kick it uses a patented PU gel to attach to your phone. It leaves no trace that it was ever there. Yes, the Kick it mobile phone stand was designed to fit on just about any major smart phone or mini-tablet. We have tested it on iPhone, Samsung, HTC, Nokia, LG & Sony and other brands as well. I have a case on my phone, can I still use Kick it? Yes, Kick it cell phone holder will work with almost any standard case for any phone. It has been tested on the following smartphone cases: Otterbox, Ballistic, Case-Mate, GelaSkins, Fortte, Incipio, Skin It, HiTech and more. It’s so simple that even a baby can use it. You just peel & stick. Then you can use your thumb to open to open the leg and stand it however you want. Instructions are included in the kit and videos can be found on our site further explaining the different types of uses. How do I use the Grip Pad for a cell phone car mount? Peel one side of the protective film away, stick to dashboard or any other surface and press firmly for a few seconds. Then remove the protective film from the other side and stick your phone to it by pressing firmly for a few seconds. See our videos and photos for an example and ideas of how to best use the grip pad. If the it ever get dirty and doesn’t stick so well, wash it with warm water and let it air dry. Do not use a cloth or paper towel to dry it. We recommend not leaving the Grip Pad in direct sunlight for prolonged periods of time. Kick it Cell Phone Holder support for our mobile phone stand. Info on our lifetime guarantee, cell phone stand instructions and cell phone car mount faqs.